Happy Monday Ladies! I hope you all are having an amazing week thus far! 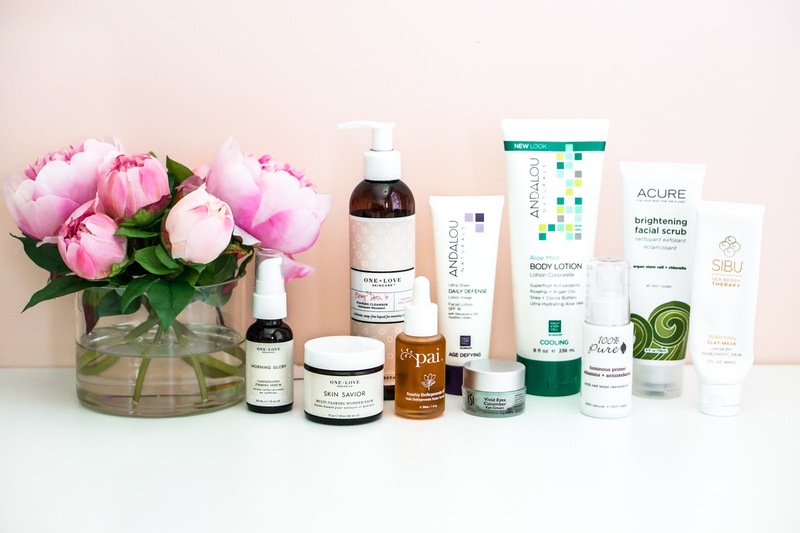 Today I am going to share with you my top 10 natural skincare products that I use daily to maintain clear, soft and young looking skin. Over the past few years I have tried to eliminate as many toxic products as possible due to the fact that we encounter so many toxins and chemicals every single day! While not all of my beauty and hair products are perfectly clean (I have yet to find a good natural hairspray), I try to at least keep my skincare and bath products as natural as possible. On that note, here is a list of my top 10 natural skincare products! 1) One Love Organics Easy Does It Foaming Cleanser: This cleanser has done wonders for my skin. I have oily/combination skin with the occasional breakout, and struggled to find a cleanser that worked with my skin. This cleanser keeps my skin clear and soft, and I love that it's organic and all natural. 2) One Love Organics Morning Glory Caffeinated Firming Serum: I have tested numerous serums over the years, and never really found one that made a noticeable difference in the tone and texture of my skin.. until this one! Unfortunately, this product will not be available for much longer, but I look forward to trying another serum from this brand. Let me know if you guys have any suggestions! 3) Andalou Naturals Ultra Sheer Daily Defense Facial Lotion: This is the first natural moisturizer I tried in my quest for "clean" skincare, and I am still using it four years later! This has become my holy grail daily moisturizer. It has SPF in it for daily sun protection, and it's definitely an affordable option for natural skincare. 4) CSI Vivid Eyes Cream: This product isn't all natural, but I have noticed a difference in the dark circles under my eyes since I have started using it. This is a good affordable option for those of you who have dark circles and fine lines like I do, but I would like to find an all natural option that is just as effective. Let me know in the comments below if you know of a great natural eye cream alternative! 5) 100 Percent Pure Luminous Primer: This is another product that I have been using for several years, and will probably never stop using it! This primer goes on the skin so smoothly, and makes my makeup look flawless when I apply it. The first ingredient in this primer is aloe, which is known for doing wonders for the skin, and it also has a variety of other oils and flower extracts to heal the skin while also priming your makeup! 6) One Love Organics Skin Savior Multi-Tasking Wonder Balm: This wonder balm is a multi-purpose product that can be used for both cleansing the skin and moisturizing. I personally like to use this product when I want to do a double cleanse. I warm the balm up in my hands and rub it on my face in circular motions. I will then use a wet, warm muslin cloth to wipe off the balm and leftover makeup on my face, while also softly exfoliating my skin. I will then proceed to use my facewash to make my face extra clean! I like to do this a few times a week, and have noticed a huge difference in the texture and clarity of my skin since starting this ritual. 7) Acure Organics Brightening Facial Scrub: I like to use this scrub about once a week to get rid of the dead skin cells that form on my face. This scrub makes my skin extremely soft, and is perfect to use before using applying tanning products. 8) Sibu Beauty Sea Berry Therapy Purifying Clay Mask: This is my holy grail face mask! I have used several masks over the years, and I find that they tend to be either a hit or a miss, but this product NEVER fails me. Whenever my skin starts to break out I will apply this in the evening and wake up with clearer skin. 9) Pai Rosehip BioRegenerate Oil: I was a little hesitant with facial oils due to the fact that my skin is naturally oily, but this facial oil has truly been a lifesaver! I apply this in the evenings before going to sleep and will wake up in the morning with baby soft skin. I also find that it helps with healing acne scars and red spots on the face. 10) Andalou Naturals Aloe Mint Body Lotion: This is my current favorite body lotion! It's lightweight formula absorbs into the skin quickly, and the mint has a cooling effect that I love, especially during the hot summer months! The best part is that it makes my skin extremely soft! It's a win/win! 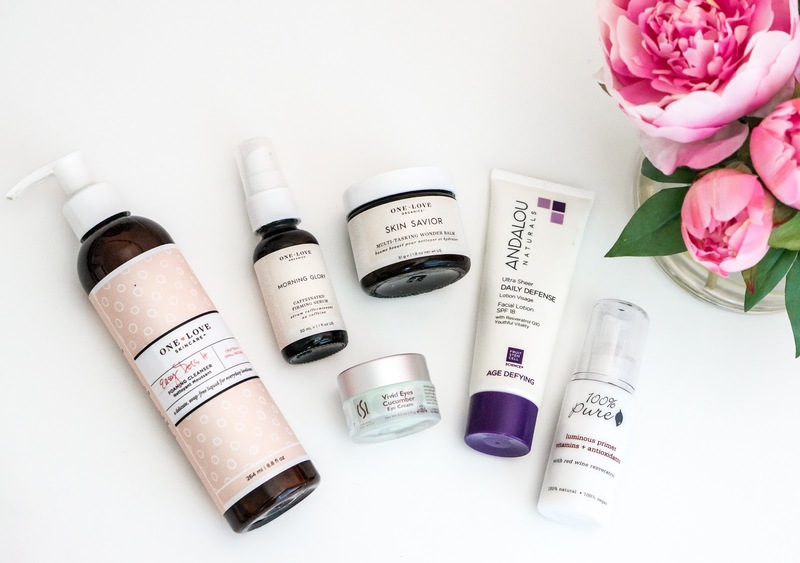 I hope you all have enjoyed this post on my top 10 natural skincare products, and I would love to know what your favorite products are for soft, clear skin! Leave a comment down below telling me your favorites, and enjoy the rest of your week! 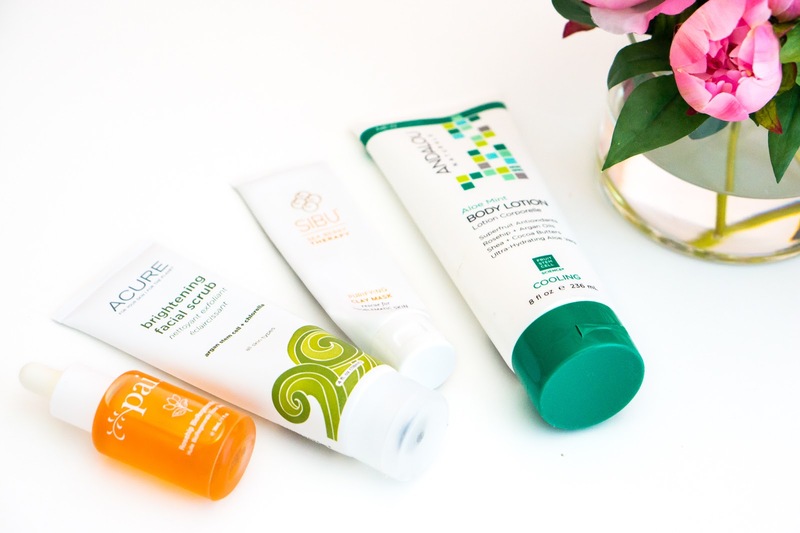 I definitely need to try some of these out because I am always looking to try more natural products with my sensitive skin! My go-to skin product is definitely the Kiehl's Midnight Recovery! It totally repairs my skin overnight. I have been super into skin care lately and I love this post! I need to try some new products! This products all look perfect! I need to try some out! !